The ePuffer Cosmos Dry Herb Vaporizer is, as its name suggests, a dry herb vaporizer, nothing more, nothing less. The Cosmos comes to us from ePuffer, a well-respected vape company whose products run the gamut all the way from e-juices to e-pipes and e-cigars. So, ePuffer has truly digitized the experience of smoking and brought it into the 21st century. The Cosmos is solely a dry herb device, so there’s no swapping out cartridges or filling up tanks with e-liquid. As it is with most dry herb vapes, you just fill up the chamber, close up the device and start vaping; the Cosmos is that easy to use. The Cosmos comes in a standard cardboard box, and for some reason, it is referred to as a “professional herb vaporizer.” I’m not sure exactly what that means, although I’ve come to adopt “professional herb vaporizer” as my job title. The Cosmos looks impressive. It only comes in one color – black – but that color suits its carbon-fiber design perfectly. I took it in my hand, and it felt incredibly lightweight, despite its higher than usual weight. And despite its light weight, it carried enough weight to feel well-built and durable. The mouthpiece was something I noticed right away. It’s flattened, rather than being rounded or with a typical Delfin drip tip. It almost looks like the mouthpiece to a small recorder, which is one of my favorite musical instruments. The next thing that you notice somewhat immediately is the OLED display screen on the side of the device that allows you to control the temperature of your vape. There are only three buttons that run down the opposite side of the screen, and all of them are marked as to their function: the power button, and the two selector buttons to control the temperature. The OLED screen is probably the only eye-catching feature of the device, even though most new dry herb vaporizers do feature an OLED screen and temperature control. But that’s what I liked about the Cosmos; it’s straightforward, elegant-looking, and quite powerful regarding vapor production. I didn’t see them at first, but by fiddling with the device, and running my finger along the top, I felt some indentations. I looked closer and realized there are some airflow valves right underneath the mouthpiece and directly connected to the heating chamber inside. So, that was a pleasant surprise, which will help with the draw. The Cosmos comes with a complementary metal grinder, which was a considerate gift, since it is a dry herb vaporizer and, if you don’t like to nitpick your herb, a grinder does come in handy to load up your device. I appreciate the gesture, ePuffer, but since I am a professional herb vaporizer, I already have my own trusty grinder. The mouthpiece isn’t threaded onto the device, so you just give it a simple twist-and-pull to reveal the ceramic chamber inside. At first, I wasn’t sure if my herb could be packed directly into the chamber. I thought the wire mesh canisters were for portable use, so you can have one pre-loaded and just put it into the oven. But no, the wire mesh canisters are where you put your material so if you are thinking about just stuffing the chamber itself with herb, don’t. This was a minus for me, however. I didn’t understand why you would fill the not-so-easy-to-fill canisters, while the chamber inside the Cosmos is quite large and deep. But after a few uses, I also saw an upside to the removable canisters, and that was it kept the chamber clean, and there was no discoloration of the chamber walls. So, we’ll wait for a final verdict on whether the canisters were a pro or a con. The Cosmos has one power button that you click three times to turn it on. Once the device is on you can begin to select your preferred temperature by using the selector buttons on either side of the power button. You can increase or decrease the temperature in individual increments, which is perfect to find the best setting for you. Depending on the quality, and moistness or dryness of your herb, you typically want to start at higher temperatures. The temperature range on the Cosmos is already high, so I just kicked the temperature up to an even 400F to start with. So, using the Cosmos is as easy as looking up at the stars. The mouthpiece is easily removed. And as I mentioned, despite the efforts that ePuffer takes to make your vaping experience much easier by including a grinder and a packing tool, getting your material into the tiny little canister can be a bit difficult. The canisters have little screw-off tops, which I also didn’t like (tiny things get lost very easily), and you can screw the top back on once you’re done filling it up. 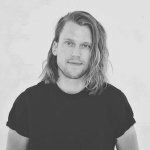 I ground my material up to an almost dust-like consistency to make loading a little easier, and I suggest you do the same. You pop the canister into the chamber like you would load a round into a revolver chamber, you put the mouthpiece back, and you turn on the device. The pull was great with the Cosmos; the vapor was practically pouring out of the mouthpiece. Heat-up time was a bit longer than with most devices, and there was no notification of when the device was ready to use, but that’s not a deal-killer. Cloud production isn’t much of a concern with dry herb vaporizers since that’s not what they are designed to do. You want a flavorful vapor, more than you want to produce cloud monsters and the flavor was plentiful with the Cosmos. One session lasted for about five minutes before I started noticing my herb getting less and less potent. And given the hassle of loading up the canisters, it was disappointing to see that I had to take out the cartridge, clean out what I vaped, and then fill it again. The Cosmos is also marketed as a loose-leaf vaporizer, so the herbs that you can vaporize includes loose leaf tobacco. I was never a smoker myself, so I wasn’t much interested in vaping tobacco, but, I suppose you could if that’s your thing. Another loose-leaf vaporizer that comes close to the Cosmos, in my mind at least, is the V2 Pro Series 3 that also requires you fill separate cartridges and load them into the device. They are both similar looking devices; they are both lightweight and portable, and they both have re-fillable cartridges. Although there is no OLED screen on the V2 Pro and therefore, no temperature control option. And this is a deal-breaker when comparing the V2 Pro to the Cosmos. The V2 Pro Series 3 is a dependable and powerful device, but, it has been around for a while now, and it has fallen behind regarding available features. For its relative newness, and temperature control feature, I would much rather go with the newer Cosmos, over the V2 Pro Series 3, despite the higher price point on the former. The all-black, checkered design of the Cosmos certainly made it stand out. It has a glossy sheen to it that caught my eye. It is about as long and as heavy as most other standard dry herb vaporizers, but the carbon-fiber material made all the difference when it came to both heat resistance and sturdiness. Temperature control on a dry herb vaporizer has now surpassed being a feature to being standard on most new devices. It has gotten to the point where, if a device doesn’t feature temperature control then, that is a definite negative. Fortunately, the Cosmos does not have that problem. Apart from the material canisters, which I’ll get to later, the Cosmos is a simple device that doesn’t require much instruction or know-how on vaporizers. I didn’t like these canisters whatsoever. They’re tiny, making them difficult to load, and clean. They are sturdy and well-made, so that’s one positive. But the screwable tops can get lost easily; and even though you do get four of them in the kit, I didn’t like the fact that I would have to keep buying these mesh shells to use the Cosmos. I could’ve have been adventurous and just packed the chamber without the canisters to see what happened, but at a price point of nearly $150, I wasn’t too keen on damaging the device. At the aforementioned $150 (which is down from $175) the Cosmos does reach a little high for being solely a dry herb vaporizer. The V2 Series 3 costs about two times less, although it is an older model. I still thought the Cosmos could be more affordable. The Cosmos from ePuffer is a solidly built and easy to use dry herb vaporizer. The temperature control feature works great, and is, more or less, essential for all dry herb vaporizers given the material it vaporizes. The canisters were a drawback, however, primarily since the heating chamber was broad and would have made for easier loading. Of course, the cartridges do make reloading the device easier, if you pre-fill all of them and take them on the road. But then again, they are a nightmare to clean despite the cleaning tools included in your package. So, I’m still up in the air about the cartridges. I didn’t like them, but I could see how they did have their benefits. There was no heat register on the device, even at its highest temperature, so I was pleased that there was no over-heating on the Cosmos. Being a newer model, with a simple, elegant design and excellent flavor production, I would recommend the Cosmos. I give the Cosmos Dry Herb Vaporizer a celestial 9/10. The Herbstick Relax Vape Review: relax with its great vapor production, sleek exterior, LED screen and the ceramic heating chamber inside. Read our review. 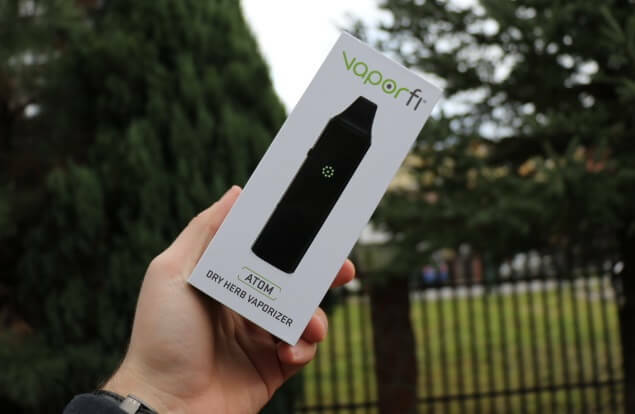 VaporFi has released a brand-new dry herb vaporizer, the Atom. Read our review below to see exactly what feature and innovations make the Atom so exciting.